There are many different kinds of SMS applications on the market today and many others are being developed. Applications in which SMS messaging can be utilized are virtually unlimited. We will describe some common examples of SMS applications below to give you some ideas of what can be done with SMS messaging. Person-to-person text messaging is the most commonly used SMS application and it is what the SMS technology was originally designed for. In these kinds of text messaging applications, a mobile user types an SMS text message using the keypad of his/her mobile phone, then he/she inputs the mobile phone number of the recipient and clicks a certain option on the screen, such as "Send" or "OK", to send the text message out. When the recipient mobile phone receives the SMS text message, it will notify the user by giving out a sound or vibrating. The user can read the SMS text message some time later or immediately and can send a text message back if he/she wants. Me: Let's have a meeting at 10 am tomorrow to discuss the details of our next SMS text messaging application. Alan: I have another meeting at 10 am. I suggest having the meeting at 11:30 am tomorrow. What do you think? A popular application of the SMS technology other than person-to-person text messaging is the provision of information to mobile users. Many content providers make use of SMS text messages to send information such as news, weather report and financial data to their subscribers. Many of these information services are not free. Reverse billing SMS is a common way used by content providers to bill their users. The user is charged a certain fee for each reverse billing SMS message received. The fee will either be included in the monthly mobile phone bill or be deducted from prepaid card credits. SMS messages can carry binary data and so SMS can be used as the transport medium of wireless downloads. Objects such as ringtones, wallpapers, pictures and operator logos can be encoded in one or more SMS messages depending on the object's size. Like information services, wireless download services are usually not free and reverse billing SMS is a common way used by content providers to bill their customers. The object to be downloaded is encoded in one or more reverse billing SMS messages. The mobile user who requests the object will be charged a certain fee for each reverse billing SMS message received. If the mobile user is using a monthly mobile phone service plan, the download fee will be included in his/her next monthly bill; if the mobile user is using a prepaid SIM card, the download fee will be deducted from the prepaid credits. A mobile phone is a device that is carried by its owner most of the time. Whenever an SMS text message is received, the mobile phone will notify you by giving out a sound or by vibrating. You can check what the SMS text message contains immediately. SMS technology allows the "push" of information. This is different from the "pull" model where a device has to poll the server regularly in order to check whether there is any new information. The "pull" model is less suitable for alert and notification applications, since it wastes bandwidth and increases server load. Some common examples of SMS alert and notification applications are described below. In an email notification system, a server sends a text message to the user's mobile phone whenever an email arrives at the inbox. The SMS text message can include the sender's email address, the subject and the first few lines of the email body. An email notification system may allow the user to customize various filters so that an SMS alert is sent only if the email message contains certain keywords or if the email sender is an important person. The use cases for fax or voice message are similar. Whenever an e-commerce or credit card transaction is made, the server sends a text message to the user's mobile phone. The user can know immediately whether any unauthorized transactions have been made. In a stock market alert application, a program is constantly monitoring and analyzing the stock market. If a certain condition is satisfied, the program will send a text message to the user's mobile phone to notify him/her of the situation. For example, you can configure the alert system such that if the stock price of a company is lower than a certain value or drops by a certain percentage, it will send an SMS alert to you. In a remote system monitoring application, a program (sometimes with the help of a group of sensors) is constantly monitoring the status of a remote system. If a certain condition is satisfied, the program will send a text message to the system administrator to notify him/her of the situation. For example, a program may be written to "ping" a server regularly. If no response is received from the server, the program can send an SMS alert to the system administrator to notify him/her that the server may be hanged. To find out the meaning of the term "SMS text messaging", you can type "find: SMS text messaging" in an SMS text message and send it to the search engine's phone number. 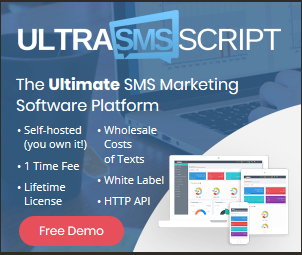 After receiving your SMS text message, the search engine parses it and finds that it begins with the command "find" and follows by the words "SMS text messaging". The search engine then knows you want to find out the meaning of the term "SMS text messaging". So, it sends a text message, which contains the meaning of the term "SMS text messaging", back to your mobile phone. If the search result is very long and it cannot contain within a single SMS text message, the search engine adds "Page 1 of 2", "Page 1 of 3", etc, at the end of the reply SMS text message. The search engine also creates a session using your mobile phone number as the session ID and stores the term that you searched for (i.e. "SMS text messaging") in the session object. To request the second page, you can send a text message with the content "page: 2" to the search engine's phone number. After receiving your SMS text message, the search engine parses it and finds that it begins with the command "page" and follows by "2". The search engine then knows you want the second page of the search result. It retrieves the term that you searched for last time from the session object and finds that it is "SMS text messaging". The search engine then sends a text message that contains the second page of the search result for the term "SMS text messaging" back to your mobile phone. Many other two-way interactive text messaging applications can be built using a similar way. For example, a company may want to build an SMS messaging application to enable its employees to query the corporate database while they are working outdoors. SMS messaging can be used as a marketing tool. An example is an SMS newsletter system. After signing up, the user will receive SMS text messages about the latest discounts and products of the company. If the user has any questions or comments, he/she can send a text message back with the questions or comments in it. The company may include its phone number in the SMS newsletter so that the user can talk to the customer service staff directly if he/she wants to do so.